BSP provided MEP design for the new Visual Arts facility at Amesbury School. The building is a single storey pavilion block with external decking and is constructed from mainly timber to respond to the "green" agenda of the project. Located in Surrey, Amesbury School sits in a 15 acre site, centred around Sir Edwin Lutyens only purpose built school building, now Grade II* listed. The new Visual Arts Centre on the site, replaced a tired prefabricated classroom. The school estate has expanded over time but always with two generic building types: - load-bearing masonry with clay-tiled roof or timber frame with boarded exterior. 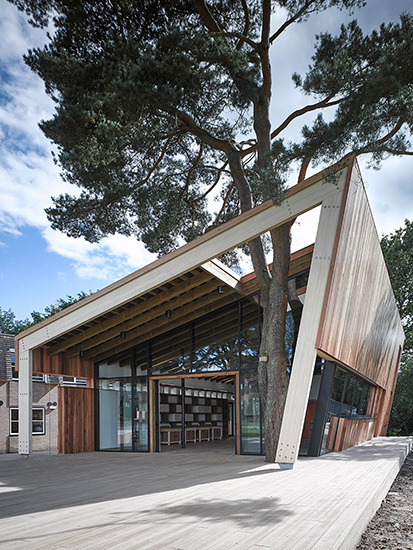 It is this latter typology that tp bennett chose for the new building for reasons of sustainability, flexibility in use and speed of construction, to create a contemporary pavilion in a landscaped setting treading lightly on pad foundations within the root protection areas of existing trees. Amesbury's new building provides internal and external space for use as display or outdoor teaching space. It offers a wide range of facilities for children aged 6-13 across the spectrum of visual arts, to support an expanded curriculum that includes drawing, painting, sculpture, printing, photography and ceramics, taught within a visually stimulating environment. The double -height space is overseen by a galleried upper level, accessible via a timber stair which is dramatically cantilevered around the canted walls of the kiln room.